Check out an updated version of Yahoo Geocode taglib. Lets you simplify access to Yahoo PlaceFinder API from JSP (and/or Coldfusion) pages. "This Google Maps mashup helps you create a QR code for a location just by centring a Google Map on your address. Once you have created the code you can place the image on your website or printed material. Then anyone can simply scan the image and bookmark your location to their smart phone, all at the drop of a hat." ISBN code validation for your JSP/Coldfusion - ISBN taglib. Researchers at Microsoft have developed mobile social networking software that lets users share personal information with friends but not the network itself. "With Contrail, the central location doesn't ever know my information, or what particular users care about" - from here. Is not it the same we wrote about Geo Messages? Privacy is a huge issue, especially regarding location. Our mashup QR maps has been updated. Lets you create QR codes for loading mobile maps. Now you can not only immediately load map into your phone but get also HTML code for placing map (QR code for it) on your site/blog etc. Map type (size) is configurable. Also mashup supports now full screen HTML5 maps (iPhone, Android) – we are using here Geo Messages tools. A new security trick from JSOS - disable URL-encoded sessions. Yet another mashup from our lab - Location from Twitter. Usually, Twitter + Maps always mean mapping twits and show them on the map. 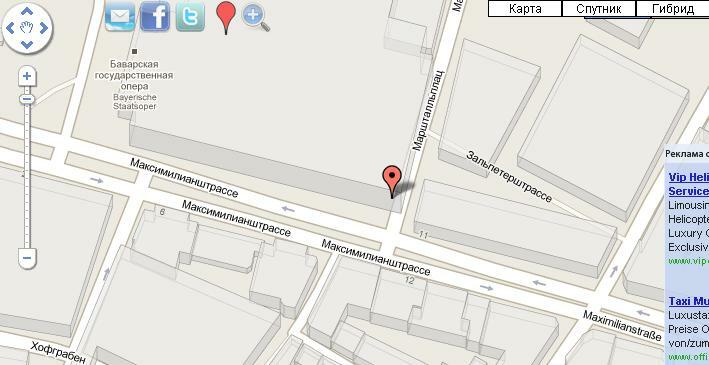 Yes, we have such mashups too (see for example, Photo map или Local twitter). But here everything is vice versa. Just a reverse task :-). Suppose you are reading a great geo-located twit. Just a status associated with some place. In Twitter’s web client you can see that place and an appropriate icon just below the message. How to get that place info and save/bookmark it on your phone? It is what our mashup - Place from Twitter is for. It is very similar to our Location bookmark, but with Twitter status instead of address. Mashup Twitter’s place also creates QR code for mobile map. 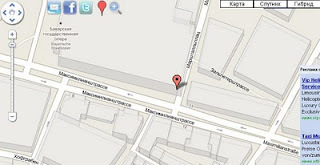 And mobile map describes a place from Twitter. And here we are using Geo Messages again. The usage is simple. Just open in Twitter’s web interface any geo-enabled twit and copy its URL to mashup’s form. Also you can save the following link Place from Twitter in your bookmarks and simply select that bookmark on any opened page with geo-enabled twit (it is so called bookmarklet). And of course, any QR code created with this mashup could be placed anywhere – on your site/blog, Facebook wall etc. You can even print it and place on the physical wall. Mashup provides HTML code you need for embedding QR code image. Our directory of bookmarklets has been updated. And driving directions as well as many other interesting things will come automatically with the mobile map (we are using Geo Messages). QR map - lets you create QR code right from the map. Also can create a link to mobile friendly map (iPhone, Android). A great source for natural language processing / text data extraction - http://streamhacker.com. Code examples with NTK. Natural Language Toolkit presents Open source Python modules, linguistic data and documentation for research and development in natural language processing and text analytics, with distributions for Windows, Mac OSX and Linux. Our mashups directory has been updated. Collect and analyze statistics for sessions in your web applications - Sessions stats listener and taglib. /via Geo Messages - this approach works on Samsung H1 too. As JIL widget exactly. Some updates on our Geo Messages project site. P.S. "Mobile operators should deliver location APIs specifically tuned for enabling check-ins, including the ability not just to place a user at a street location, but to a more fine-grained spot as well — for instance, the business at that location. Also, think about ways that existing telecom offerings could drive Foursquare-style services. For instance, could SMS become a major conduit into Foursquare the way it is into Twitter today (and the way Twitter is trying to explicitly link itself to Foursquare, as we saw above)? All it would take is some smart integration between SMS and network location APIs and servers." - from here. Great words. It is exactly what Geo Messages approach is for. It integrates mobile messaing and location. Our mashup Location in Twitter has been updated. Lets you post (share) some location data in Twitter. Suppose you need to inform readers about some meeting place, show office location etc. - this mashup lets you post mobile friendly map link. Or you simply need to tell where you are without switching on geocoding in Twitter - use this tool. Some form of check-in. Our mashup Mobile maps has been updated. Full screen map for mobiles (iPhone, Android) lets you share location info as a signature for the standard messages. P.P.S. by the way, on your desktop you can create a QR code for such link and let visitors of your site load address of your company (event etc.) right to own mobile phone. Our mashup Mobile map has been updated. This mobile web application lets you share location info via Email, SMS, Twitter or Facebook. Mashup works with any HTML5 browser, so you can use it on iPhone, Android platform, Samsung phones etc. This application is yet another implementation for our Geo Messages approach – share location info on peer to peer basic, using signed messages. See that fb link? Hit it and share link to this map with your Facebook social graph. You will see when it was saved as well as the links for getting routes to this location. P.P.S. Note again - the map itself does not keep links back to your facebook account. This map knows nothing about you. So this map actually does not hurt your privacy. Map itself just says: hey, there is a saved marker. Nothing more. And this map is again nothing more than just an ordinary link in your Facebook stream. There are no your ID's within the map. It is actually a main idea behind Geo Messages project – how to share location without revealing your ID. Open any info window for the tip and hit icon near the venue name. You will get a discussion forum associated with this venue. Share the link (see icon on the top of the screen) and discuss this place. 1. Twitter stream in your PowerPoint. A nice suite from SAP. 2. Credit cards validation in JSP (and/or Coldfusion). Lets you check the following cards (formats): VISA, MasterCard, American Express, Diners Club, enRoute, Discover and JCB. New format in Google Maps? on the API level we've used a standard G_NORMAL_MAP type. But for Munich it looks like 3D view. Is it something new in Google Maps? /via Geo Messages - innovative HTML5 mobile web mashups. Our mashup Geo Talk has been updated. It lets you create forums (discussions) linked to the particular place on the map. Technically, it is Google Maps + cloud forums from Disqus.